While a simple to-do list may be sufficient for completing small projects around the house when it comes to project management, a more detailed plan of action is usually needed. One of the most popular and practical ways to manage the timing of all of the tasks of a project is to use a Gantt chart. A Gantt chart is a chart that shows all of the different sub-tasks of a project and how they relate to each other in terms of time. It's a way of displaying your project schedule, and it helps get the work done on time. It shows all of the tasks that need to be done, the amount of time each task is expected to take, the time frames in which individual tasks are to be completed, and the relationship between various tasks. This way, everything gets done on schedule, and you never waste time waiting for a task to be completed that should have been done already. Here are nine key components of Gantt charts. One of the main components of a Gantt chart, the dates allow project managers to see not only when the entire project will begin and end, but also when each task will take place. Large projects always consist of a large number of sub-tasks. 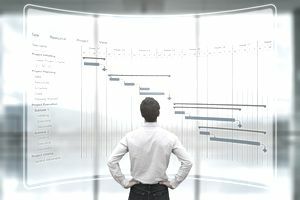 A Gantt chart helps project managers keep track of all of the sub-tasks in a project, so nothing is forgotten or delayed. Once the sub-tasks have been listed, bars are used to show exactly when each sub-task should take place. This helps ensure that every sub-task is done on schedule so that the entire project will be completed on time. When Gantt charts were initially developed, they were written by hand, making changing or updating the chart laborious. Thankfully, with today's current project management software, project managers can easily add, subtract and modify tasks without needing to adjust the entire chart by hand. Milestones are those tasks that are instrumental to a project's completion and success. Unlike the minor details, which also have to be done, completing a milestone offers a sense of satisfaction and forward motion. On a Gantt chart, milestones are displayed as diamonds (or, sometimes, a different shape) at the end of a particular taskbar. While some of your tasks can be done at any time, others must be completed before or after another sub-task can begin or end. These dependencies are indicated by small arrows between the taskbars on a Gantt chart. While many sub-tasks can be completed fairly quickly, there will be plenty of times when you will want to see at a glance exactly how your project is coming along. This can be accomplished by shading the task bars to represent the portion of each task that has already been completed. Another way to see your project's process at a glance, a vertical line marker indicates the current date on the chart. It helps you manage your time effectively as you can see at a glance how much you have left to do and see if you are on track to complete the project on time. In today's fast-paced business world, you likely have several tasks going on at the same time. Including the task ID on the Gantt chart helps everyone involved to quickly identify the task you are talking about. While not every Gantt chart lists the names of the people who will be working on it, if your project will be completed by a number of individuals, listing names and the tasks that are assigned to them can be incredibly helpful. When managing a project, you need to make sure all of the individual tasks are completed in a timely and efficient manner. A Gantt chart will help you do just that.